Hallenberg - Gluck - "Ah non son io che parlo"
She is highly sought after as a concert singer and she frequently appears in concert halls throughout Europe and North America. She has built an unusually vast concert repertoire that spans music from the early 17th Century works of Monteverdi and Cavalli, via Mozart, Beethoven, Berlioz, Mahler, Martin and Chausson up to 20th-century works of Franz Waxman and Daniel Börtz. 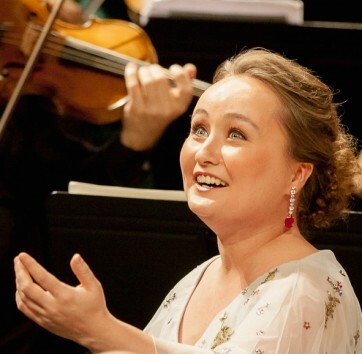 She has performed with orchestras such as the Berliner Philharmoniker, Orchestre de Paris, Orchestre national de France, Royal Concertgebouw Orchestra, Accademia Nazionale di Santa Cecilia, London Symphony Orchestra, BBC Symphony Orchestra, Los Angeles Symphony Orchestra, Orchestre Symphonique de Montréal, Barcelona Symphony Orchestra, Russian National Orchestra, Swedish Radio Orchestra, Royal Stockholm Philharmonic Orchestra and the Danish Radio Orchestra. She enjoys a special close collaboration with the ensembles Les Talens Lyriques, Il Pomo d’Oro and Europa Galante. Ann Hallenberg regularly works with conductors such as Fabio Biondi, William Christie, Sir John Eliot Gardiner, Emmanuelle Haïm, Daniel Harding, Andrea Marcon, Marc Minkowski, Riccardo Muti, Kent Nagano, Sir Roger Norrington, Sir Antonio Pappano, Evelino Pidò and Christophe Rousset. 2017 has so far included the title role in Agrippina at Opera Vlaanderen, Marguérite in La damnation de Faust in London and La Côte-Saint-André with Orchestre Révolutionnaire et Romantique, Vagaus in Juditha triumphans in New York and Illinoi with Venice Baroque Orchestra, Mahler’s Rückert Lieder in Amsterdam with the Royal Concertgebouw Orchestra, Beethoven’s Symphony No. 9 in Brussels, Antwerp and Gent with the Royal Flemish Orchestra, Elgar’s The Dream of Gerontius in Dortmund with Dortmunder Philharmoniker, Bach’s St John Passion in Rome with Accademia Nazionale di Santa Cecilia, Medea in Handel’s Teseo in Moscow with Russian National Orchestra, Gismonda in Handel’s Ottone in Vienna and Beaune, and recitals with the pianist Magnus Svensson in Madrid as well as in Stockholm Concert Hall. In the summer of 2017 her latest solo-CD “Carnevale 1729” was released and it is receiving raving reviews. She has so far performed the program in Vienna, Venice, Halle and Froville with Il Pomo d’Oro and there are several more concert coming.